We are obliged to Backhouse Jones, the specialist transport solicitors, for the following account taken from their latest ‘Backchat’ newsletter. As of 6 April 2017, HMRC requires operators paying drivers the Industry Scale Rate for overnight subsistence allowance to apply for an Approval Notice. Operators must now demonstrate that they have a checking system to ensure that the amount claimed for subsistence correlates with the amount spent. 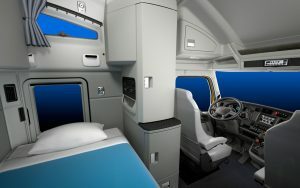 The Industry Scale Rate is currently £26.20 per night for drivers with a sleeper cab in the vehicle and £34.90 per night for drivers without a sleeper cab. An operator who, due to their specific requirements, regularly pays more than these amounts must apply for a Bespoke Scale Rate Agreement which again must be backed up by an appropriate checking system. Therefore, Operators can continue to pay overnight subsistence tax free providing they get an Approval Notice from HMRC. In addition, they must have a random checking system in place to ensure that they are satisfied that drivers are actually incurring the expenses they are claiming. Whilst an operator will need to cross reference work schedules and time sheets, a further check on driver receipts e.g. for hotels/food/parking, should be carried out to ensure the costs were incurred. The HMRC models suggests that for a small employer (less than 100 workers) a 10% check of all employees’ expense claims should be made, and the check must be random, for example every 10th claim received. Employees should be required to retain receipts for a period of 12 months from the date of expenditure. For more details on the changes, see https://www.gov.uk/hmrc-internal-manuals/ employment-income-manual/eim66130 or contact a member of the employment team.